Elizabeth doing what she loves best- cooking!!!! And when you add to that the fact that M&Ms are involved, well, that's an entirely different level of fun!!! Oh, and I must add, she ate WAY more M&Ms than actually made it to the cookies!!! We made little individual packages for her to give out to her friends. She LOVED handing them out!!! Here's the back of the card. A special picture from Elizabeth and her famous "E" that is signed on all cards these days. YUM! The finished product!!! And BOY they were GOOD!!! 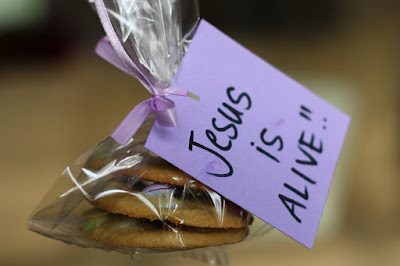 My mom used to make these every Easter time (if it wasn't every year, it seemed like it!!). She made them to take to the Easter egg hunt that was at our church. BOY did I LOVE when Mom made these cookies!! We got to help and yes, just like Elizabeth, we all ate WAY MORE M&Ms than we actually put on top of the cookies!!!! Mix together butter and sugars. Stir in egg and vanilla. Carefully mix in flour, baking soda and salt. 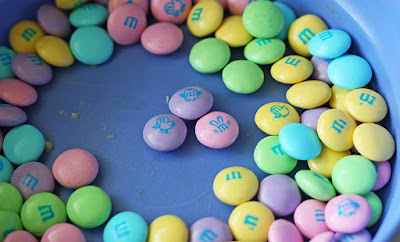 Once all is incorporated, stir in M&Ms. 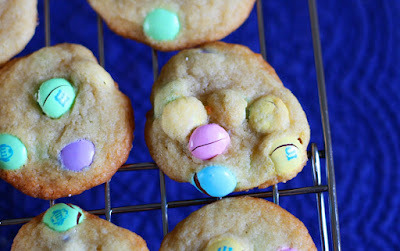 Drop by rounded tablespoon onto prepared cookie sheet and place a few extra M&Ms on top of each cookie. Bake in a 350 oven from 9-13 minutes*. *PLEASE be sure and watch your cookies carefully so that you do not burn them. Every oven is different. Each pan you bake on is different. One of my pans is light colored and the other one is dark colored. The darker colored pans always cook faster than the lighter colored pans. Just pay attention! No one wants to serve burnt cookies to their family! Oh my!!!! 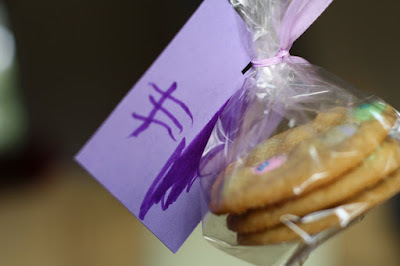 Love the way you packaged the cookies! I just might have to borrow that. That is a cute little cook in your kitchen! What a neat little idea. I really like the "Jesus is Alive". It looks like you had a great time. SO great! Jesus IS alive! AMEN! Thanks for the dessert idea. 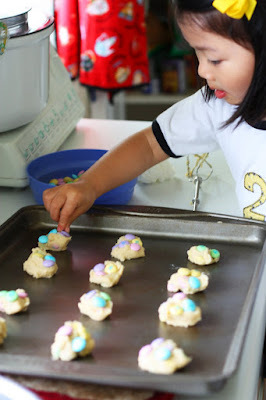 We are having some company for dinner tonight and I believe we will do these cookies. Thanks for sharing. Too cute! And such a great idea to celebrate Easter with friends and neighbors! It's so nice that you spend time doing these "little" things with Elizabeth. She'll treasure these times so much as she grows up. Mrs. U~~~ You are such a great mom, Alexis loves to cook too, but you seem to have more patience then me~~~This post has inspired me to let her help more often instead of me just wanting to get it done!!! The tags are awesome~~~yay for Jesus!!!!! This looks like such a nice thing to do! I just discovered your blog in my favorites folder but don't remember being here before.I'll try to get back to visit again--such a nice blog!